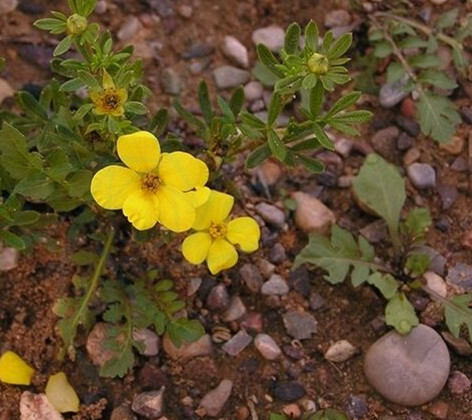 The drug is the dried or fresh flower or leaf of Potentilla parvifolia Fisch. (Family Rosaceae), growing on dried mountain slopes, in crevices, in or near forests, and distributed in Heilongjiang, Nei Mongol, Gansu, Qinghai, Sichuan and Tibet of China. Sweet, cold; bladder and kidney meridians entered. Flower or leaf is used as diuretic, antioncotic, for the treatment of beriberi with cold-damp type and prurigo, externally for mastitis.